University property tags (a.k.a. 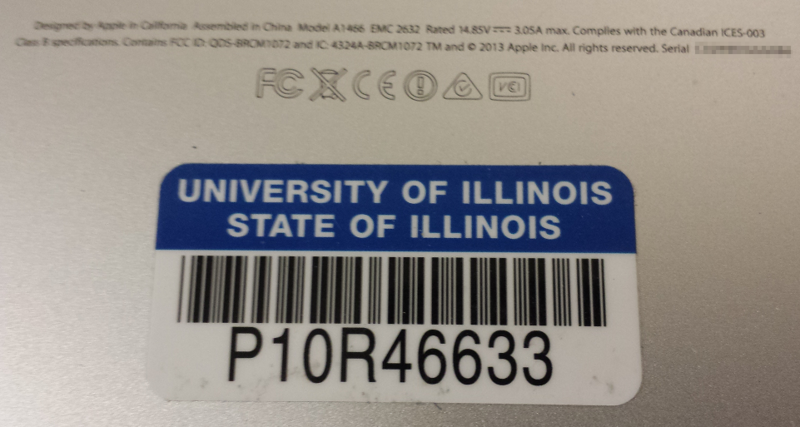 PTags) are serialized stickers permanently attached to property purchased with university (or grant-based) funds. These tags can help IT Pros more easily identify and track university-owned computers, which can be important for authorizing network access and software licensing. So Engineering IT may ask you to provide a PTag number when discussing equipment. Engineering IT does not track ownership of equipment belonging to your department. Property purchased by your department or research group must be inventoried and tagged by your department's business office, or your group's business administrator. Note that not all equipment is required to have a PTag. Generally, only equipment costing over a certain amount is required to have a PTag. If equipment does not have a PTag, Engineering IT may need to confirm with you or your business personnel whether a given piece of equipment is university-owned or not. For reference, below is shown an example of a common modern university PTag. Other forms of tag do exist. They may look different depending on their age. On computer equipment, PTags are often placed near a device's serial number or other identifying markings.